Porcelain fused to metal (PFM) restorations has been the standard for decades. PFM crowns and bridges consist of porcelain fused to a cast alloy coping, or porcelain fused to Captek. We use only quality alloys and top-of-the-line porcelain, Ceramco3, for our PFM cases. We purchase our alloys from the reputable manufacturers that participate in the IdentAlloy program, so you know the nobility (semi-precious or precious alloy content) of the restoration you prescribe is the nobility of the restoration you receive. We can also accommodate pink porcelain requests when the need exists to replicate tissue due to recession or bone loss. Simply provide us with a shade guide for the tissue shade you’d like us to match, or provide us with an Ivoclar Gingiva shade, G1 through G6, and we’ll create the appearance of tissue where needed. Captek makes an internally reinforced gold material that exhibits the color, workability, and nobility of pure gold, along with the strength and stability of the platinum/palladium family of cast alloys. It is not a cast alloy. The composition is 83.9% gold, 5.3% platinum, 7.3% palladium, 2.8% silver, and <1% iridium/ruthenium/rhenium. All elements are high nobility and high purity. 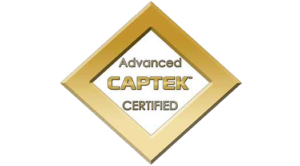 Captek is not only strong and stable but, unlike traditional alloys, non-oxidizing and non-corrosive, as well. This means that gray lines at the tissue are permanently eliminated. The gingiva is not only unaffected by Captek, but positively affected. There is less gingivitis and recession around a Captek crown. Bacteria in the mouth can result in periodontal disease, bad breath, heart disease, lung infections, and even a weakened immune system. Captek composite metal restorations are actually clinically proven to minimize bacteria and plaque build-up by at least 71% vs. natural healthy tooth structure, helping to maintain and often improve your overall oral health. Global Dental Solutions is a Certified Advanced Captek laboratory. Ceramco3 porcelain by Dentsply Sirona is one of the world’s premier brands for crown and bridge restorative products and materials. Ceramco porcelain is renowned for its reliable quality and ease of use, characteristics that and ensure consistent outcomes of fixed prosthetic restorations. Ceramco3 is a feldspathic porcelain. This high potassium formula is much more stable than low-potassium feldspar that has to be “cooked” with other minerals before it can be used. The result is predictable, affordable restorations with out-of-the-bottle shades and components allowing for a multitude of new effects. New and improved dentin modifiers deliver chromatic and hue effects that allow for natural variation and greater forgiveness during the build-up. Get personalized answers to your questions today.